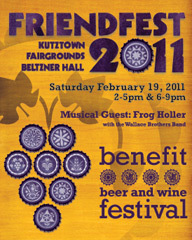 This past weekend a couple friends and I attended a beer and wine festival called Friendfest. If you've never been to one of these gigs, basically breweries and wineries set up at tables and offer free samples of all the different kinds of booze they brought. Overall, beer and wine fests are a great way to try out new drinks, but honestly, they are usually pretty pricey. In my area they can run anyway from $25-$50 per ticket and may or may not include food. But, there just might be a way to avoid the ticket price. My friends and I volunteered to work one of the two sessions of Friendfest (about 3 hours of work) and then got to drink for free in the other session. In some situations, depending on the state the fest is in, you have to be certified to serve alcohol if you're helping pour drinks for a brewery or winery which can present an upfront cost to do the training. But if you plan to attend several festivals, it might be worth it to get certified. To set up volunteering, find out who's in charge of the festival and offer to help out in any way they need it. They all use volunteers so this won't be a foreign concept. Contact them as soon as you find out about the festival to maximize the possibility that they still need volunteers for the event. Then, enjoy the perks that come with the job. If you missed my other post about how to get free beer. Check out my other post: Boston & Beyond: Get Free Beer.